Yesterday, I left the following comments and questions for TAG Mental Health Managing Editors via the ICD-11 Beta drafting platform. In order to read the comment in situ you will need to be registered with the Beta drafting platform, logged in, then click on the grey and orange quote icon at the end of the category Title. Definitions for three uniquely coded severities for Bodily distress disorder: Mild; Moderate; Severe, have recently been inserted into the Beta draft. The Definition for Bodily distress disorder (BDD) and its three severity characterizations appears to be based on the BDD disorder descriptions in the 2012 Creed, Gureje paper: Emerging themes in the revision of the classification of somatoform disorders . As conceptualized by the ICD-11 Expert Working Group on Somatic Distress and Dissociative Disorders (S3DWG), BDD is proposed to replace the seven ICD-10 Somatoform disorders categories F45.0 to F45.9, and F48.0 Neurasthenia. The S3DWG’s BDD has no requirement for symptom counts, or for symptom patterns or symptom clusters from body or organ systems, which describes a disorder framework with good concordance with DSM-5 Somatic Symptom Disorder (SSD). According to the Beta draft, BDD’s three severity specifiers are proposed to be characterized on the basis of the extent to which responses to persistent, distressing bodily symptoms are perceived as excessive and on the degree of impairment, not on the basis of number of bodily symptoms and number of body or organ systems affected. In comparison, psychobehavioural responses do not form part of Fink et al’s (2010) Bodily Distress Syndrome criteria. BDS’s criteria and two severities are based on symptom patterns from body systems (a BDS Modest, single-organ type and a BDS Severe, Multi-organ type). The PCCG’s proposals described a disorder construct that had good concordance with Fink et al’s Bodily Distress Syndrome, drawing heavily on Fink et al’s criteria set. Although at that point, the PCCG proposed to incorporate some SSD-like psychobehavioural features within their tentative criteria. The PCCG appeared to be proposing a modified version of the Fink et al (2010) BDS construct. In an Ivbijaro G, Goldberg D (June 2013) editorial , the co-authors advance the position that the forthcoming revision of ICD provides an opportunity to include BDS in a revised classification for primary care. According to this June 2013 editorial, the PCCG’s proposal for a modified BDS disorder construct, which it had earlier proposed to call “Bodily stress syndrome (BSS),” appears to have been revised to using the Fink et al “Bodily distress syndrome (BDS)” term. The editorial implies that BDS (which subsumes the so-called “functional somatic syndromes,” CFS, ME, IBS, Fibromyalgia, chronic pain disorder, MCS and some others, under a single, overarching disorder) was expected to be progressing, imminently, to ICD-11 field trials. According to Lam et al (2012) and Ivbijaro and Goldberg (June 2013), the model proposed is that of “autonomic over-arousal,” which the authors consider may be responsible for most or all of the somatic symptoms that are experienced. The term “Bodily distress disorder” and the term “Bodily distress syndrome” (Fink et al, 2010), which is already operationalized in Denmark in research and clinical settings, are often seen being used interchangeably in the literature. For example, in this very recent editorial by Rief and Isaac . Also in papers by Fink and others from 2007 onwards . However, the S3DWG’s defining of a “Bodily distress disorder” construct has stronger conceptual alignment and criteria congruency with DSM-5’s SSD and poor conceptual and criteria congruency with Fink et al’s BDS. That SSD and BDS are very different concepts is acknowledged by Fink, Creed and Henningsen  . Although the 2013 Ivbijaro and Goldberg editorial implies that Fink et al’s BDS construct was going forward to ICD-11 field testing, it is the S3DWG’s Bodily distress disorder name and construct that has been entered into the Beta draft – the construct that has stronger conceptual alignment with DSM-5’s SSD. So the current proposals and intentions for field testing a potential replacement for the SDs remain unclear. This is severely hampering professional and consumer stakeholder scrutiny, discourse and input. 1. Have the S3DWG sub working group, the PCCG working group and the Revision Steering Group reached consensus over a potential replacement framework and disorder construct for ICD-10’s Somatoform disorders and F48.0 Neurasthenia, and the ICD-10-PHC categories: F45 Unexplained somatic symptoms/medically unexplained symptoms, and F48 Neurasthenia? 2. Which recommendations are being progressed to international field testing and does ICD-11 intend to release the protocol or other information on finalized characteristics, diagnostic guidelines, criteria, inclusions, exclusions, differential diagnoses etc, that are planned to be used for the field tests and which would provide the level of detail lacking in the public version of the Beta drafting platform? 3. 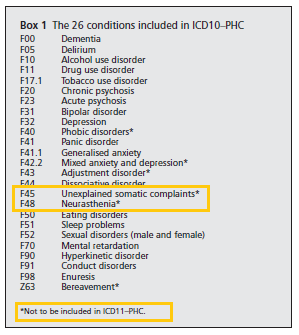 If, in the context of ICD-11 usage, the S3DWG working group’s proposal for a replacement for the Somatoform disorders remains for a disorder model with good concordance with the DSM-5 SSD construct, what is the rationale for proposing to name this disorder “Bodily distress disorder”? 4. 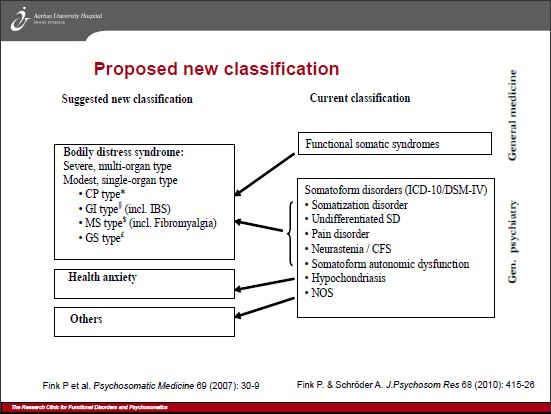 Have the S3DWG, PCCG and Revision Steering Group given consideration to the significant potential for confusion if its replacement construct for the Somatoform disorders has greater conceptual alignment with the SSD construct but is assigned a disorder name that sounds very similar to, and is already being used interchangeably with an operationalized but divergent construct and criteria set? 5. Fink P, Toft T, Hansen MS, Ornbol E, Olesen F. Symptoms and syndromes of bodily distress: an exploratory study of 978 internal medical, neurological, and primary care patients. Psychosom Med. 2007 Jan;69(1):30-9. 6. Medically Unexplained Symptoms, Somatisation and Bodily Distress: Developing Better Clinical Services, Francis Creed, Peter Henningsen, Per Fink (Eds), Cambridge University Press, 2011. In September, Professor Oye Gureje (who chairs the ICD-11 Expert Working Group on Somatic Distress and Dissociative Disorders), will be presenting on Proposals and evidence for the ICD-11 classification of Bodily Distress Disorders, as part of series of symposia on the development of the ICD-11 chapter for mental and behavioural disorders, at the World Psychiatric Association XVI World Congress in Madrid, Spain, 14–18 September 2014. Unfortunately, I cannot attend this September symposia but would be pleased to hear from anyone who may be planning to attend. This report updates on recent additions to the listing for Bodily distress disorder in the public version of the ICD-11 Beta draft. This is an edited version of the report published on July 19. Bodily distress disorder (BDD) is a new, single diagnostic category that has been proposed for ICD-11. It is intended to subsume the seven ICD-10 Somatoform disorders categories F45.0 – F45.9, and F48.0 Neurasthenia. Bodily distress disorder (BDD) is the term that has been entered into the Beta drafting platform since February 2012. It is the term and disorder construct that has been proposed by the ICD-11 Expert Working Group on Somatic Distress and Dissociative Disorders (S3DWG), which is chaired by Professor Oye Gureje . Note: the term Bodily stress syndrome (BSS) (Lam et al, 2012) is an alternative disorder term and diagnostic construct that has been proposed by the ICD-11 Primary Care Consultation Group (PCCG), which is chaired by Professor Sir David Goldberg . The disorder term and construct Bodily distress syndrome (BDS) has also been advanced for ICD-11 in a June 2013 editorial by Ivbijaro G and Goldberg D .
Neither of the terms Bodily stress syndrome (BSS) or Bodily distress syndrome (BDS) has been entered into the ICD-11 Beta draft. A Definition for category Bodily distress disorder was inserted into the Beta draft in late January 2014. At that point, no definitions or characterizations for any of the uniquely coded BDD severity specifiers (currently, BDD, mild; BDD, moderate; BDD, severe) had been inserted. How is BDD being defined for the purposes of ICD-11? The psychological and behavioural features that characterize Bodily distress disorder, as currently defined in the Beta draft, are drawn from the disorder conceptualizations in the 2012 Creed, Gureje paper on emerging proposals for the revision of the classification of somatoform disorders . This paper sits behind a paywall but I have had a copy since it was first published. The paper describes a disorder model that has poor concordance with Fink et al’s Bodily Distress Syndrome construct. – which describes a disorder framework into which DSM-5′s “Somatic Symptom Disorder (SSD)” could potentially be integrated, facilitating harmonization between a replacement for the ICD-10 Somatoform disorders and DSM-5’s new SSD. Whereas, Fink et al’s 2010 Bodily Distress Syndrome criteria are based on impairment and symptom patterns from body systems. Positive psychobehavioural features do not form part of the Fink et al criteria [4–6]. For ICD-11’s BDD, patients may be preoccupied with any bodily symptoms and the presence of a co-occurring physical health condition is not an exclusion. BDD’s three severity specifiers are proposed to be characterized on the basis of the extent to which responses to persistent, distressing symptoms are perceived as excessive and on degree of impairment, not on the basis of the number of bodily symptoms and the number of body or organ systems that are affected by the disorder. 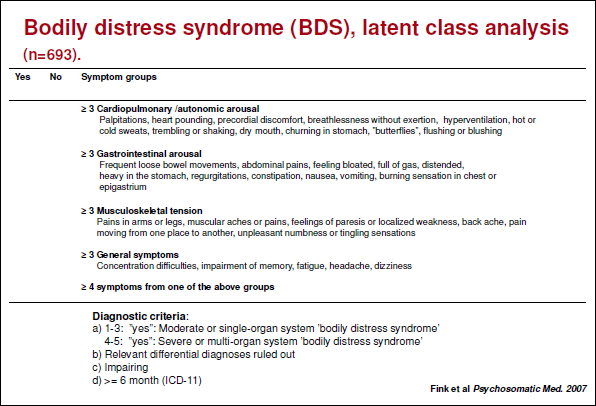 In contrast, BDS’s two severities are based on symptom patterns (a BDS Modest, single-organ type and a BDS Severe, Multi-organ type). Both BDD and BDS are intended to subsume the Somatoform disorders and Neurasthenia. But BDS seeks to arrogate the so-called “functional somatic syndromes,” CFS, ME, IBS, Fibromyalgia, chronic pain disorder, MCS and some others, and subsume them under a single, overarching BDS diagnosis . So although the BDD and BDS disorder names sound very similar (and the terms are sometimes seen used interchangeably), as defined in the 2012 Creed, Gureje paper and as defined by the recently inserted Beta draft Definitions, ICD-11’s BDD and Fink et al’s BDS present divergent constructs*. It is the ICD-11 Primary Care Consultation Group‘s 2012 proposals for a “Bodily stress disorder”  that had stronger conceptual alignment and criteria congruency with Fink et al’s BDS. *Discussions between Profs Creed and Fink during the Research Clinic for Functional Disorders Symposium presentations, Aarhus University Hospital, May 15, 2014, noted that Fink et al’s BDS and DSM-5’s SSD are “very different concepts.” That SSD and BDS are divergent constructs is also discussed in: Medically Unexplained Symptoms, Somatisation and Bodily Distress: Developing Better Clinical Services, Francis Creed, Peter Henningsen, Per Fink (Eds), Cambridge University Press, 2011.
have been inserted into the Beta draft. Bodily distress disorder, mild is a form of Bodily distress disorder in which there is excessive attention to bothersome symptoms and their consequences, which may result in frequent medical visits. The person is not preoccupied with the symptoms (e.g., spends less than an hour per day focusing on them). Although the individual expresses distress about the symptoms and they may have some impact on his or her life (e.g., strain in relationships, less effective academic or occupational functioning, abandonment of specific leisure activities) there is no substantial impairment in the person’s personal, family, social, educational, occupational, or other important areas of functioning. Bodily distress disorder, moderate is a form of bodily distress disorder in which there is persistent preoccupation with bothersome symptoms and their consequences (e.g., spends more than an hour a day thinking about them), typically associated with frequent medical visits such that the person devotes much of his or her energy to focusing on the symptoms and their consequences, with consequent moderate impairment in personal, family, social, educational, occupational, or other important areas of functioning (e.g., relationship conflict, performance problems at work, abandonment of a range of social and leisure activities). Bodily distress disorder, severe is a form of bodily distress disorder in which there is pervasive and persistent preoccupation to the extent that the symptoms may become the focal point of the person’s life, typically requiring extensive interactions with the health care system. Preoccupation with the experienced symptoms and their consequences causes serious impairment in personal, family, social, educational, occupational, or other important areas of functioning (e.g., unable to work, alienation of friends and family, abandonment of nearly all social and leisure activities). The person’s interests may become so narrow so as to focus almost exclusively on his or her bodily symptoms and their negative consequences. What will ICD-11 be field testing? Field testing of a potential replacement for the existing ICD-10 Somatoform disorders framework is expected to be conducted over the next year or two. Disorders that survive the ICD-11 PHC field tests will require an equivalent disorder in the main ICD-11 classification. 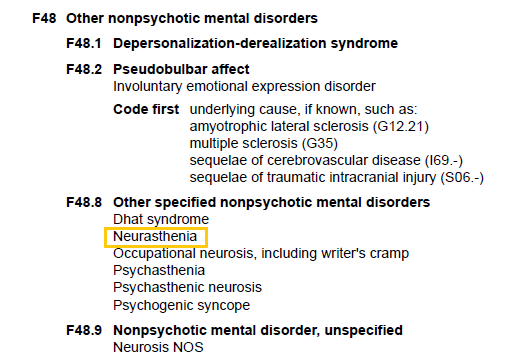 So whatever replaces the existing ICD-10 PHC categories, F45 Unexplained somatic symptoms/medically unexplained symptoms and F48 Neurasthenia, (which is also proposed to be eliminated for the ICD-11 primary care version), will need an equivalent disorder in the main classification. International field tests across a range of primary care settings had been anticipated to start from June, last year, but there were reported delays. It isn’t known whether consensus has been reached yet over disorder construct and diagnostic criteria for use in the field tests, or whether field testing is now underway. I cannot confirm whether ICD-11 intends to release a protocol into the public domain for whatever construct it plans to field test, or may already be field testing. Currently, there is no publicly available protocol or other information on finalized characteristics, diagnostic guidelines, criteria, inclusions, exclusions, differential diagnoses etc. that are planned to be used for the field tests which would provide the level of detail lacking in the public version of the Beta drafting platform. So which construct does ICD-11 Revision Steering Group favour? 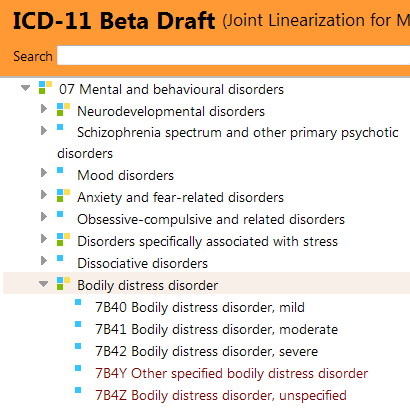 Although BDD (and now its three severities) have been defined within the Beta draft, much remains unclear for proposals for the revision of this section of ICD-11 Mental and behavioural disorders. The ICD-11 Primary Care Consultation Group’s alternative 2012 Bodily stress syndrome (BSS) construct – a near clone of Fink et al’s BDS criteria but with some SSD-like psychobehavioural responses tacked on – isn’t the construct that is entered and defined within the Beta draft. In June 2013, Prof Gabriel Ivbijaro (not, himself, a member of the PCCG) and Prof Sir David Goldberg (who chairs the PCCG) published a joint editorial in Mental Health in Family Medicine, the official journal of The World Organization of Family Doctors (Wonca) Working Party on Mental Health, for which Prof Ivbijaro is Editor in Chief. The authors advance the position that the forthcoming revision of ICD “provides an opportunity to include BDS in a revised classification for primary care” and imply that BDS (at least at that point) was progressing, imminently, to ICD-11 field trials. This brief editorial was embargoed from June 2013 to June 2014 and I was unable to obtain a copy until last month, but you can read it now for free and in full here: Bodily distress syndrome (BDS): the evolution from medically unexplained symptoms (MUS). Note, firstly, that the editorial does not declare Professor Goldberg’s interest as chair of the ICD-11 Primary Care Consultation Group. It does not clarify whether the views and opinions expressed within the editorial represent the views of the authors or are the official positions of the PCCG working group, or of the International Advisory Group for the Revision of ICD-10 Mental and Behavioural Disorders, or of the ICD-11 Revision Steering Group (RSG), or of any committees on which co-author, Prof Ivbijaro, sits or of any bodies to which Prof Ivbijaro is affiliated. No publicly posted progress reports are being issued by ICD-11 or by either of the two groups making recommendations for the revision of this section of ICD and I do not have a second source that confirms the status of proposals as they stood in June 2013. But taking the editorial at face value, it would appear that the PCCG had revised its earlier proposals for a BSS construct (that drew heavily on Fink et al’s BDS criteria but had included the requirement for some psychobehavioural responses) and were now recommending that the Fink et al BDS construct and criteria should progress for ICD-11 PHC field testing and evaluation, that is, using the same disorder name and (presumably) the same criteria set that is already operationalized in research and clinical settings, in Denmark. The editorial doesn’t clarify whether the PCCG, the S3DWG and the ICD-11 Revision Steering Group (RSG) had reached consensus – it does not mention the alternative proposals of the S3DWG, at all, or discuss what is entered into the Beta draft, or discuss the views and preferences of the Revision Steering Group for any of recommendations made by the two advisory groups, to date. It is unclear whether a “pure” BDS construct (as opposed to the PCCG’s earlier BSS modification) had already gained Revision Steering Group approval for progressing to field testing, at the point the editorial was drafted, or whether Prof Goldberg was using this Wonca house journal as a platform on which to promote his own opinions and expectations, in a purely personal capacity. Crucially, it doesn’t explain why, if a BDS-like construct were anticipated to be progressed to field trials in the second half of 2013, it is the S3DWG’s Bodily distress disorder diagnostic construct that has been listed and defined in the Beta draft for Foundation, Mortality and Morbidity, Primary Care High Resource, Primary Care Low Resource linearizations – not the PCCG’s 2012 BSS modification, or the “pure” BDS that Prof Goldberg evidently champions. As a source of information on the current status of proposals for the revision of the Somatoform disorders this June 2013 editorial is problematic (and now also over a year out of date). I suspect the politics between the 12 member PCCG (which includes Marianne Rosendal*), the 17 member S3DWG and the ICD-11 Revision Steering Group are intensely fraught given Professor Goldberg’s agenda for the revision of the Somatoform disorders, since fitting BDS into ICD-11 hasn’t proved to be the shoo in that Fink, Rosendal and colleagues had hoped for**, and given that BDS cannot be harmonized with DSM-5’s SSD, as they are conceptually divergent. *Dr Marianne Rosendal (Department of Public Health, Aarhus University), who has published with Prof Per Fink, is the European representative on WONCA’s International Classification Committee. The vice-chair of the PCCG is Dr Michael Klinkman, a GP who represents WONCA (World Organization of Family Doctors). Dr Klinkman is current convenor of WONCA’s International Classification Committee (WICC) that is responsible for the development of ICPC-2. **Presentation, Professor Per Fink, March 19, 2014 Danish parliamentary hearing on Functional Disorders. Prof Fink stated that he and his colleagues had tried to get WHO to incorporate a section for a special group of disorders where BDS could be placed that was located neither in psychiatry nor in general medicine, but had not been successful. “If, in the context of ICD-11 usage, the S3DWG working group’s proposal for a replacement for the Somatoform disorders remains for a disorder model with good concordance with DSM-5′s SSD construct, what is the rationale for proposing to name this disorder “Bodily distress disorder”? No response has been forthcoming. Lack of publicly posted progress reports by both working groups, confusion over the content of the Beta draft and ICD Revision’s failure to respond to queries from stakeholders is hampering stakeholder scrutiny, discourse and input. 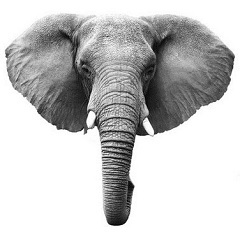 It is time clinicians, researchers, allied professionals and advocacy organizations demanded transparency from ICD Revision around current proposals and field trial intentions. In September, Professor Oye Gureje (who chairs the ICD-11 Expert Working Group on Somatic Distress and Dissociative Disorders), will be presenting on Proposals and evidence for the ICD-11 classification of Bodily Distress Disorders, as part of series of symposia on the development of the ICD-11 chapter for mental and behavioural disorders, at the World Psychiatric Association XVI World Congress, in Madrid, Spain, 14–18 September 2014 . Unfortunately, I cannot attend this symposium presentation but would be pleased to hear from anyone who may be planning to attend. 5. Fink P and Schröder A. One single diagnosis, bodily distress syndrome, succeeded to capture 10 diagnostic categories of functional somatic syndromes and somatoform disorders. Journal of Psychosomatic Research 2010;68:415–26. 7. World Psychiatric Association XVI World Congress, Madrid, Spain, 14–18 September 2014.